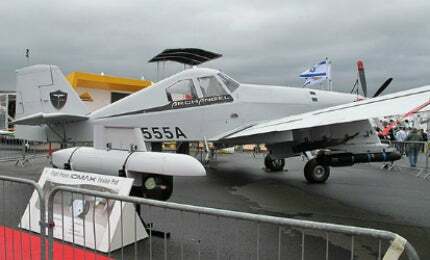 The Archangel border patrol aircraft is manufactured by IOMAX USA. Image: courtesy of Tangopaso. The Archangel armed surveillance aircraft was unveiled at the Paris Air Show 2013. Image: courtesy of Tangopaso. The Archangel aircraft has a speed of 210ktas. Image: courtesy of Julian Herzog. Archangel has an endurance of up to 10.4 hours. Image: courtesy of Tangopaso. Archangel®, an armed surveillance aircraft manufactured by IOMAX USA, is designed to provide military and special forces with improved precision strike capabilities against fixed and moving targets over land and at sea. It is the Block 3 evolution of the Air Tractor AT-802 agricultural aircraft and can be deployed in intelligence, surveillance and reconnaissance (ISR), border security, law enforcement, counter-terrorism, maritime patrol, stand-off precision strike, medium / low intensity conflict, and counter piracy, as well as counter-drug, and disaster relief missions. The aircraft was unveiled at the Paris Air Show 2013 and completed maiden flight in July 2014. The Atlantique ATL3 maritime patrol aircraft, successor to the Atlantique ATL1 and ATL2, incorporates an enhanced weapon system with a maximum 9,000kg payload, new technology engines, glass cockpit and sophisticated avionics and sensors. IOMAX received an order from the UAE Special Operations Command for 24 Archangel aircraft in Block 1 and Block 2 configurations in 2009. The first aircraft under the order was delivered in November 2010. The UAE sent its six Block 1 aircraft to Jordan for use in ISR missions in 2013. IOMAX was awarded a contract to supply Archangel border patrol aircraft for the UAE Air Force & Air Defence (AF & AD) in September 2014. L-3 WESCAM received a subcontract from IOMAX in February 2015 to provide 28 MX™-15D EO / infrared (IR) turrets for integration on the UAE’s Archangel aircraft. The Archangel border patrol aircraft was offered to the Philippines Air Force (PAF) as a replacement of Rockwell OV-10 Bronco counterinsurgency fleet in June 2014. "The final investment decision (FID) for the project is expected to be made in late 2015, or early 2016." The Archangel border patrol aircraft is based on the Thrush Aircraft’s S2R-660 (710) airframe. It features a large wing area and a fixed, reinforced landing gear, which facilitates safe take-off and landing on unimproved, dirt, grass and gravel surfaces. The airplane has a length of 11m and a wing span of 17.4m. It can carry 2,177kg of payloads externally, and has day and night operational capability. A crew of two are accommodated on the airplane in a dual control, tandem seat configuration to render increased visibility. The aircraft incorporates air conditioning system, lightning protection system, flame detection system / fire warning system, emergency fuel jettison, and oxygen systems. The aircraft can be armed with a variety of air-to-ground missiles and bombs including 12 AGM-114 Hellfire missiles, 10 250lb GBU-58 Mk-81s and six GBU-12 Mk-82 laser-guided bombs, 24 Roketsan Cirit laser-guided missiles, and up to 12 UMTAS AGM laser-guided missiles. Six hardpoints, three under each wing, are provided to carry the weapons. The AGM-114 Hellfire missiles can be mounted in the IOMAX Dual Rail Launcher, while the Cirit rockets are stored in a quad pack launcher. The IOMAX Dual Ejector Rack is equipped to carry GBU-58 Mk-81 and GBU-12 Mk-82 laser-guided bombs. The aircraft also features one centreline hardpoint under the fuselage for mounting additional munitions or reconnaissance / strike / data link pod. The Archangel armed surveillance aircraft features front and rear night vision compatible (NVG) glass cockpits equipped with CMC’s Esterline Cockpit 4000 avionics suite. Three 5in x 7in multi-function displays (MFD) and one up front control panel (UFCP) are provided in the front cockpit whereas the rear cockpit is fitted with one 5in x 7in MFD and one UFCP. A mission computer is installed to drive the MFD and the UFCP. The avionics suite consists of a range of systems including Cobham CVN-251 VHF Nav navigation system, STEC System-2100 autopilot, Honeywell KRA-405B radar altimeter, Bendix / King KTA-970 traffic collision avoidance system, and L3 GH-3900 Electronic Standby Instrument System, Artex ELT 1000 emergency locator transponder. It also include Cobham CDM-451 distance measuring equipment, Honeywell IRU Laser Ref VI inertial reference unit, Becker ICS DVCS 6100 radio / intercom control system, Dukane DK-120 underwater beacon, Blue Sky GPS based data / voice, and L3 TACAN+. The airplane incorporates advanced surveillance and targeting systems to capture real-time imagery and video, and provide improved situational awareness. The sensor suite consists of L3 Wescam MX-15 or Star SAFIRE 380 HLD electro-optical / infrared (EO / IR) camera, Avalex AVM-4177 N EO / IR display sensor, Aero Computer AK-4 software mission keyboard, Aero Computer UC-5300 moving map system, and AVR-8414 digital video recorder. Archangel also features communication and navigation radios, UHF / VHF /F M and SATCOM communications, transponders, line of sight video downlinks, TERMA AN/ALQ-213 missile warning system, and an optional Selex SEER radar warning system. An IOMAX armament control system is installed to control the weapons. The Archangel border patrol aircraft is powered by Pratt & Whitney’s PT6A-67F turboprop engine, which has a generating capacity of 1,600shp. The engine drives a five-bladed MTV-27 MT propeller. Maximum take-off gross weight of the aircraft is 14,800lbs and the fuel capacity is 670 gallons. The aircraft’s cruise and maximum speeds are 180ktas and 210ktas respectively, while the maximum altitude is 25,000ft above mean sea level, range is 1,350nmi at a speed of 175ktas, and endurance is more than 10 hours.